"By recognizing the natural dignity of those around us in the context of formal social occasions such as dining and dance, we recognize and manifest the natural dignity within ourselves. Through this, the manifestation of innate nobility is inevitable." Embodying Natural Dignity is one of the primary practices explored by Shé-zér and Namgyal - two teachers from the Aro gTér Tradition of Tibetan Buddhism. It was with no small surprise that we found ourselves sitting in our local public house some months ago raising a glass of Herefordshire Pale Ale with two most unusual drinking companions. On reflection, we’re not sure which was the greater surprise: the identities of the couple with whom we found ourselves sitting, or the affect that the shock at having seen them sitting there had, which made us forget all trace of self-consciousness, and so invite ourselves to join their table. 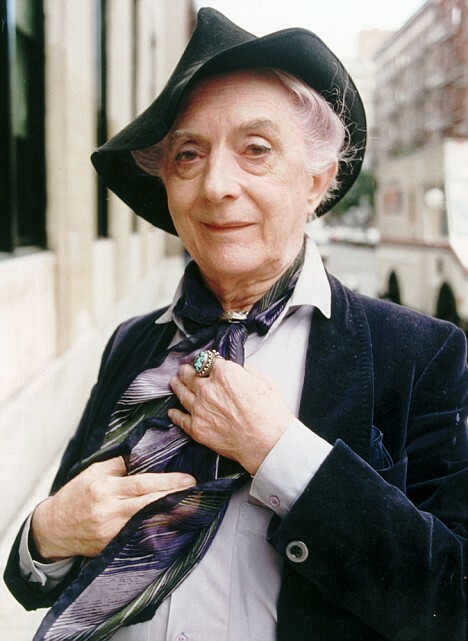 Quentin Crisp was of course the most immediately recognisable. His distinctive voice sounded sharp and clear across the lounge bar of the Castle Inn, and drew the eyes of everyone in the establishment. Even were he sat silently, the purple fedora perched at a jaunty angle atop his head would have marked him out instantly. Indeed his presence was instantly recognisable even though our first vantage by the bar only afforded a view of his back. His companion sat opposite him in the bay window was providing him with her fullest attention, in spite of the distraction of the bright display of snow falling outside the Inn’s window. She seemed somehow familiar to my eyes (my wife of course recognized her more swiftly even than she did Quentin), yet she was dressed in a rather old fashioned manner and somehow I couldn’t quite place her face, or her voice. Quentin paused for a moment in his speech, apparently having made his point robustly, for the lady looked downward for a moment as if considering her reply. When she looked up, her words told me immediately who she was. Jane closed the book that she had sat upon her lap and likewise turned her gaze to me. My wife nudged me gently in the ribs, and words started to spill from our lips spontaneously, as outside the snow continued to fall. Copyright - Jo and Cris Watkins - 2012. Watermark theme. Powered by Blogger.